As World Radiocommunication Conference 2015 (WRC-15) moves into its second week in Geneva, consensus is shaping up around a new, 15 kHz-wide secondary 60 meter allocation, at 5351.5-5366.5 kHz, with amateur stations limited to an effective isotropic radiated power (EIRP) of 15 W. Consideration of an allocation in the vicinity of 5.3 MHz for Amateur Radio is Agenda Item 1.4 at the International Telecommunication Union (ITU) conference. 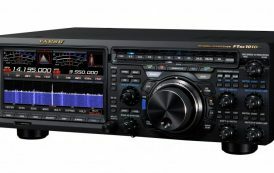 ARRL Chief Technology Officer Brennan Price, N4QX, noted that an allocation at 5 MHz has been a long-time objective of Amateur Radio, and that the service now is one step closer to having one, thanks in part to the timely reversal of the initial US “no change” position. The power cut from the current 100 W is “unfortunate,” Price said, but a necessary cost at this time to achieving the allocation and gaining the flexibility of operation now lacking on 60 meters. “An allocation is always a win, and we have a reasonable chance of a win,” he concluded. ARRL Technical Relations Specialist Jon Siverling, WB3ERA, is also part of the US delegation to WRC-15.